Bedtime is the ideal time to focus young minds on the truths of God's Word! This hardback volume offers parents and carers of young boys a wonderful resource for making bedtime a special time of reflection. A devotion for every night of the year! Ages 4-7. 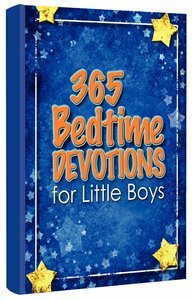 About "365 Bedtime Devotions For Little Boys"